But the dressing is so good, it's enough all on its own. I try to keep a jar of this dressing in the fridge pretty much at all times now. If I heat up some leftovers for lunch and it lacks veggies, I make myself a little half-assed side salad. If I'm in the middle of making dinner and just don't have the energy left to tackle the side dish I had planned, I scrap it and make my half-assed spinach salad. So I guess I should have called this "Half-Assed Shallot Dressing" but that's not fair; the salad is half-assed, not the dressing. 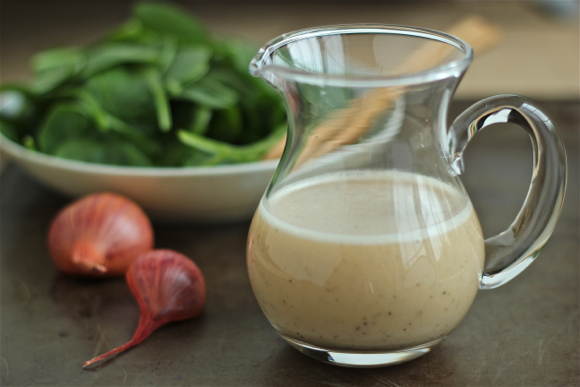 The dressing is simple, creamy and tangy-sweet -- and a breeze to prepare. Do you have any half-assed shortcut side dishes? The Ninj wants to know. Whirl all the ingredients in a food processor or blend them together in a container with a hand blender until smooth. Store in a the refrigerator. Nobody in my family eats many veggies, so I try to include fruit as a side with most meals. I also like cucumbers and tomatoes with a little italian dressing. During the summer I do mom's standard zucchini in olive oil with a can of petite diced tomatoes. Lately I've been hooked on those steam-in-the-bag frozen veggies or rice. I love those, since they're easy to keep on hand and you just throw the whole bag in the microwave. Can't get more half-assed than that! Hey, you do what you can to get them to eat *something*, right?! I also try to keep those containers of greens on hand. A quick and easy side dish is always a salad. Love this dressing! Let me know what you think of it if you try it, Pam. 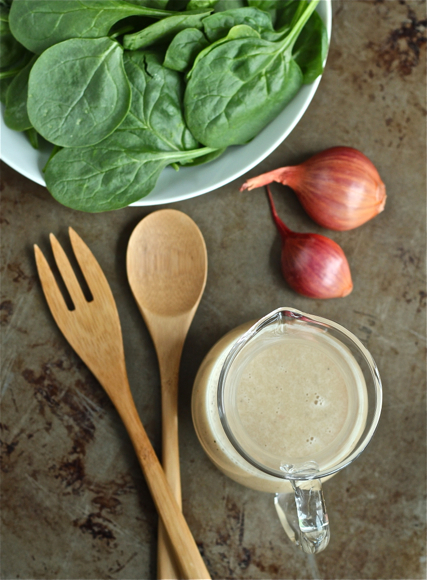 Sounds great -- you could easily swap honey for the sugar in this recipe as well. I think you'll dig it, Eileen. Lately I've been grilling slices of green cabbage. With just a little spritz of cooking spray on the grill pan, and a pinch of salt on the cabbage, it cooks up to a sweet and delicious side veggie. Definitely going to have to try this dressing though, it sounds delicious and perfect for half-assed spring salads! We grill romaine all the time -- now I'll have to try cabbage!